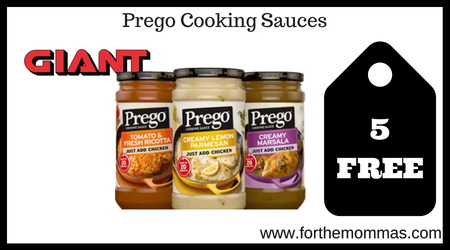 Giant: 5 FREE Prego Cooking Sauces Starting 8/17! Starting 8/17, Giant will have Prego Cooking Sauces for $2.00 each. Get a $5.00 off instantly. Plus also stack a $0.75/1 Prego Cooking Sauce coupon with an Ibotta rebate to make the final price 5 FREE plus $3.25 moneymaker! Note: Please check the date on your Ibotta rebate if you plan to do this deal because sometimes, Ibotta moves expiration dates up.